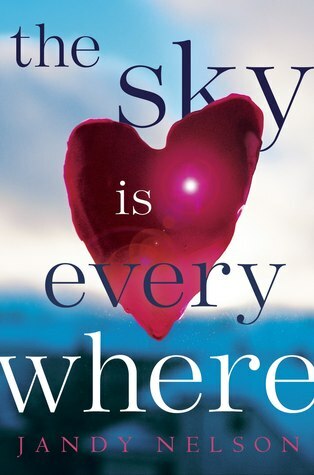 Book Review: The Sky is Everywhere by Jandy Nelson. Good morning lovely people! Today I'm back with another book review, once again for a contemporary novel. I seem to be on a bit of a romance kick recently as you've probably gathered from my last couple of reviews and this book was no different. I'll leave the blurb below in case you haven't heard of this book and then I'll give my general thoughts and feelings before hitting up with the spoiler section! So I had mainly mixed feelings on this book. Overall I did really enjoy it however due to the very nature of the themes explored (loss, grieving etc) in times it felt quite heavy. I definitely didn't laugh or smile as much as I had expected to. With that being said, however I did like the story progression and I felt as though the characters had a nice arc. All the subplots and side characters were really unique and well done also. One thing I would say is that I didn't find our main character that relatable. In a way she was, (I get being introverted and shy and feeling like you're living in a shadow) but I haven't lost a sister, and I can't even imagine how horrific that would be. Neither have I had to deal with the absence of a mother for the most part of my life, so once again I felt it hard to relate to Lennie's family situation. I think if you're looking for a book that has a deeper meaning than most YA contemporaries then you'd probably enjoy this. Overall I'd give it 3.8 stars and a 70%. Now onto the spoiler section, so if you haven't read this book, go away, read it and we can discuss! Right so first of all we have this love triangle going on: Lennie X Joe, or Lennie X Toby? Right from the off I could see how this was going to develop and I was definitely sitting firmly on Joe's side. However I could see why Lennie was so attracted to Toby, he represents everything about Bailey and no one seemed to understand her grief (in Lennie's opinion) like Toby. However it was not a healthy relationship, they were essentially using one another to feel closer to Bailey and in turn feeling a lot of guilt. I mean, he was her boyfriend?! Like WTF?! And as soon as she started messing with Toby behind Joe's back I just knew he would find out. I mean it was so stupid. Like why didn't she just tell him that you know, before they were dating she was kinda seeing Toby? And then she should have just stayed away from him?! Like it didn't make sense to me, she was playing them, and I felt bad for Joe especially who really liked her. Gahh, so many poor life decisions! So yeah, I was glad that her and Joe managed to work things out because I did ship them. I mean I wasn't like overly fangirling but they were a good couple. Okay now let's talk about her mum. I've gotta say I was expecting her to make an appearance. I mean for continuities sake, it was better that she didn't, but nonetheless I think it would have made a great plot twist. Lennie could really have done with her mum at points and it would have been interesting to hear more about why she left and why she is the way she is. But I totally get why she didn't include that storyline and I've made my peace with it. Lastly I wanted to highlight some of my favourite side characters. Her gram to start with was just so funny and sassy and made such a fab double act with Big. Both of them made me laugh so much in that scene when they were pretending to tag along with Lennie when she went off to see Joe. I loved how obsessed she was with the flowers and her artwork and the colour green. So many unique things that we don't often get to see in YA. And of course Big was fantastic. Like, the amount of puns we got surrounding his height just made me chuckle, he was like the epitome of hippie-cool. And that's all, if you've read this book, do share your thoughts below, along with any book recommendations! I will literally read anything so hit me up with your faves! 5 Fashion and Beauty Bloggers You Have To Read! Stepping Into Spring with Boohoo. Falling Back In Love With Fiction Writing. Celebrate Mother's Day 2016 With Me!